As with any child of an icon, a great deal of responsibility comes with the the creation and delivery of your own ideas. London-based vocalist Marla Brown comes from the foundation of UK-style reggae as the daughter of the late Crown Prince of Reggae Dennis Brown. She’s released a 7-song EP that represents her first foray into the music business. A touring dancer and performer, she also has been a semi-finalist on the TV program Britain’s Got Talent. She is continuing her father’s legacy, singing with a honey-rich tone and deep resonance that reflects his own. 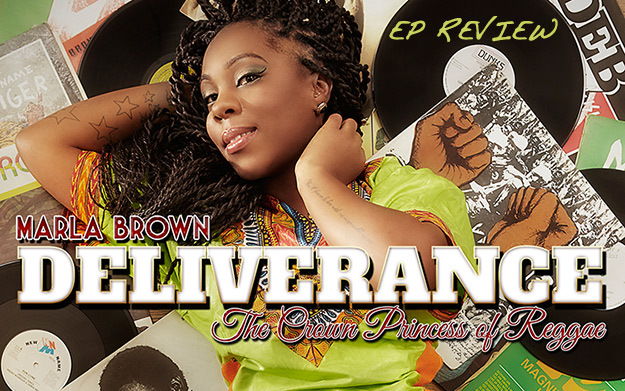 By naming the EP Deliverance, Marla aims to represent her own “deliverance” into the world of the music business whilst giving a nod to her father. With Better Days Marla gives her own interpolation on the song Deliverance Will Come by her dad, emulating the cadence of that song’s chorus to sing “better days will come”. With great tone, she sings over a lush rhythm created by Royal Order Music and released as part of the Smart Riddim, this tune was released as a single back in April, 2015. For One Shot, crashing cymbals intro a tune that addresses a shooting incident, as Marla B exclaims she is “running from the law”. As Marla herself explains further, these are “the words spoken in the perspective of a dying soul whom has been caught up in the crossfire amongst the government and civilians. Being at the wrong place at the wrong time, or is it the right time? as it draws attention to the inflicted endangerment of lives lost by weaponry and boastful power.” Guest Runkus comes in with the raggamuffin style to punctuate this reality message. On Superstar there is a celebratory vibe of encouragement to muster inner strength and pursue love of the self. A self-esteem message, with soaring, agile vocal runs and vibrato expanding on this theme. Mama (Earth) is sung over an R&B tempo, produced by Dynasty Records. Here Marla expresses her idea that in this modern era we have lost the ability to allocate time to love and be loved. She implores mother nature to intervene as she says to “give me a chance” for love to grow. Here Comes the King pays tribute to her father Dennis Brown as she delineates all of his stellar attributes and intersperses a few lyrics from his songs to illustrate her sentiments like “Riding on the King’s highway…” as heard in Promised Land. If this EP is any indication Marla Brown will continue to present her thoughtful, conscious lyrics sung in a tone that is cultivated from great genetics and hard work.